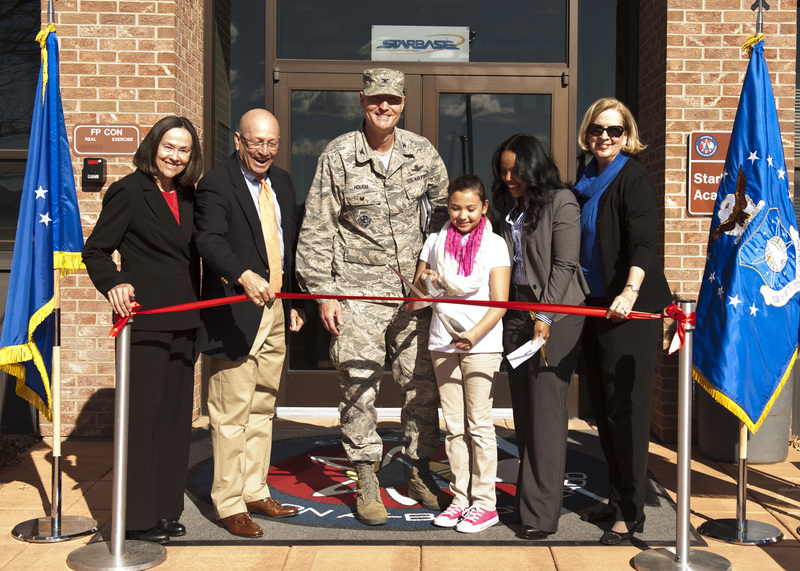 February 11, 2015 – A ribbon cutting ceremony marking the official STARBASE Academy opening took place February 2 at Peterson Air Force Base in Colorado. McAuliffe Elementary School fifth-grader Stephanie Molina positioned the ceremonial scissors and snipped the red ribbon opening the pathway to unique encounters with Science, Technology, Engineering, and Mathematics education. The STARBASE Academy focuses on Science, Technology, Engineering and Mathematics education and operates on a set curriculum. The classes combine teaching and hands-on experience to provide students with something that will stick with them after their time at STARBASE is over. Peterson Air Force Base has been working to make STARBASE a reality for a long time. Plans to bring STARBASE to Peterson were ready to go when sequestration hit, Hough said. He credited retired Gen. Gene Renuart and his wife Jill for their commitment and effort to bring the facility to fruition. The STARBASE program targets fifth grade students from local public schools. Public schools provide transportation to and from the academic site for their students. STARBASE is a five-day program with students attending one day per week for five weeks. The first day covers the engineering design process and students build an “eggbert” space shuttle. The program also covers math mysteries and students examine hair and DNA, Newton’s Laws of Motion, build models of molecules, cover chemistry and even Bernoulli’s Principle and a geocaching activity. The facility has unique equipment on site and more coming soon. For example, a CREO 3D computer assisted design program was provided by John Deere and the Department of Defense. To make the program even more valuable, STARBASE will get a 3D printer in the coming months. Collaboration is a big part of what STARBASE does as well. Hampton pointed out a planned field trip to the Peterson Museum, a tour of the 302nd Airlift Wing’s C-130s and a guest from Schriever Air Force Base talking about STEM and how it is used on the job. Funding for the building’s renovation came from the Office of the Assistant Secretary of Defense for Reserve Affairs in the amount of $335,000. Air Force Space Command covered the remaining $118,600 for construction and design. In March, OASD-RA provided $450,000 to cover startup costs and first year operation expenses. The facility includes a director’s office, two instructor spaces, one assistant area and two classrooms. Along with Hampton, there are two full-time instructors and two part-time assistants. In addition to the Renuarts, other individuals noted for their contribution to bringing STARBASE to Peterson were Ernie Gonzalez for his advocacy and funding, and Barbara Koscak, co-founder of STARBASE Academy, for her support and efforts in establishing the program. For more information, visit: http://dodstarbase.org/.